How Wonderful! Your Business Expanding? Your business is going like gang-busters and it is time for you to expand…. Will you expand by adding a new location? Or, will you just get a larger facility? Or, maybe, you will be adding to your fleet of vehicles? If you’d like for us to contact you about your signage needs, please complete the form below and click the submit button. Or, you can call (678) 714-8700 and let us see how we can help with your growing business needs. In 2015, the state of Georgia passed a law legalizing fireworks sales beginning on July 1st. Just before then, we were contacted by Joe Kordupel, of Phantom Fireworks, to help him open up three Georgia locations – Buford, Duluth and Morrow – in time for Fourth of July sales. Joe was so happy with the service we provided he continued to use us for all their sign needs as they opened more Georgia locations. Towards the end of last year, Joe asked us to also begin working with Phantom Fireworks locations across the country. One such opportunity was in Erie Pennsylvania. Channel Letters were retrofitted to LEDs, which are brighter and more energy-efficient than neon. Phantom’s tag line is Lighting Up Backyards of America from Coast to Coast®. Just like with their products, they like for their signs to light up the sky and be seen. The Erie store was undergoing renovations to expand its operation. For this project, Joe needed us to do two things. First up was to update the existing channel letter sign. Channel letters today are usually constructed with LEDs, which are much brighter than the neon used for fabrication in the past. The other advantage LEDs have over neon is that they are much more energy-efficient. So, for this part of the project we were asked to change the neon lighting to LED lighting. This was a fairly large project since there were two sets of letters, each 48 inches tall. When the upgrade was completed, the letters were now 50% brighter than they were before. And, the electricity needed to run them is about 90% less than with the neon, saving them a good bit of money. We expect payback to be realized in 18 months. 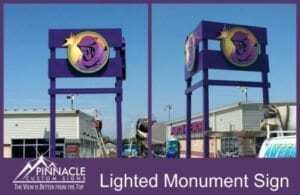 New 35′ Lighted Monument Sign brings brand recognition along I-90 in Erie, PA.
Part of the expansion project included creating a 35 foot tall monument structure. This height was needed to ensure that the sign could be seen by drivers along I-90. The structure itself was made of steel and painted their signature purple color to make sure they stood out. For this we fabricated two custom-formed light boxes in the shape of their logo, each having an 11-foot radius. The cans were then fitted with pan faces depicting their trademark Phantom logo. The ultimate effect on the entire store front was dramatic and eye-catching. Between the upgraded channel letters and this new monument sign, they now get much more visibility from their signage. Are you renovating your location? Why not upgrade your signage at the same time, making sure that your signs project the excitement of your new look. Let us know if we can help. 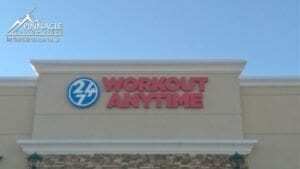 Randy Clevenger who currently owns two franchise locations of WorkOut Anytime Fitness contacted us to see if we could help them out with a location about 10 minutes from our facility. 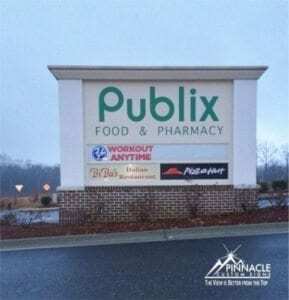 They were taking over four suites in a Publix shopping center which had very different elevations. When they first contacted us, they asked us to help with the channel letter sign they needed to identify the new location. Their clubs are close to home. Parking is never a hassle with easy in, easy out. Cost is never a barrier. A membership costs less than getting the newspaper. Best of all, you can work out anytime — when it’s best for your busy schedule. The key to this project was to maximize the size of the wall sign and still make it fit within the sign ordinances for the City of Braselton. After several renditions of the sign, we arrived at a final design of the sign that met these criteria . One requirement for the sign was that it had to be made of individually mounted letters, rather than them being mounted on a raceway. While this was not a restriction by the city, it was required by the owner of the shopping center. This is a great example of why it is important to not only be aware of the sign code for the local jurisdiction, but also to be conscious of the landlord’s sign requirements. After getting the “green light” from all parties, we then started working to obtain a permit from the City of Braselton. While waiting on the permit approval, we put up their logos on the tenant marquee signs and gave them a “Coming Soon” banner to display so that it got people excited about the new fitness facility. Once we had the letters manufactured we coordinated the install and had the sign up well before their grand opening. We enjoyed working with a new franchise and hope to work with Randy and his team in the future as they expand across the Atlanta market.